I have bought 18 shares of SBUX in my taxable account and 20 shares of KO in my Roth IRA. I have decided that the Industrial sector has rallied too much recently and I have missed the opportunity. I will wait until a further drop to put cash to work. The industrial sector is volatile so I prefer to buy those stocks while they are on sale to add a safety margin. I entered in SBUX as a speculative position. I am impressed by its recent growth and dividend increase. I added to KO in my Roth to add stability. Previously I had the Roth IRA funds in ARCP, which have been completely sold. I have sold all my 86 shares in ARCP today after the announcement of securities fraud. It is against my beliefs to do business with people with low integrity. ARCP has demonstrated today that it is a company that can't be trusted. My losses were around $200 (0.4% of my dividend portfolio) which is small, since my ARCP position was a speculative one. I will be putting the remaining cash to work soon after I decide on my next purchase. Yes, the selloff was crazy and the price may come back up. But I would rather lose $200 and learn from my mistakes than to have many sleepless nights. This will add around $61 of additional dividends annually and places my position in XOM at around $2744. I will be trying to allocate additional positions to meet my sector allocation goals. Below are graphs showing what I have now and what my goals are. I am going to aim at adding more energy and industrial stocks this week. 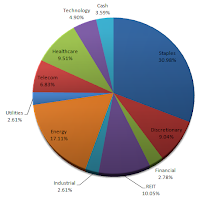 I really would like to increase my current 17.1% in energy and 2.6% in industrials. The ultimate goal is 24% in energy and 7% in industrials. In addition to the cash, I will be selling my ~$1000 position in CMCSA this week to fund my purchases. CMCSA is not a dividend champion or contender and I had it more as a speculative play when I had free trades. I believe low gas prices will help the industrial sectors. Current gas prices have dipped tremendously. I am eyeing UTX, MMM, LMT, NSC, and ITW. In terms of MMM's price, I think the PE is a bit too high for me. I am preferring the PE (in relation to their past history) for UTX, NSC, and ITW. I am looking at NSC instead of CSX and UNP due to its lower PE. LMT has is a bit on the pricey side but it offers a nice yield and decent payout ratio. Most industrial stocks do not have yields over 3%. I prefer LMT over RTN, despite it being a higher PE, because LMT has a higher yield. LMT - bit pricey but nice 3.31% yield and nice recent div increase.. Whenever the price of oil falls I get a smile on my face. Not only do I pay less at the pump, but I can pick up extra shares of CVX and XOM with my extra money. I have added around $1000 to Chevron last week. This week I plan to add more but into a different oil major. Unfortunately the price of the oil companies have risen slightly since the lows of a couple days ago. However, they are still down from their highs by a significant amount. I am deciding to add to my position in XOM this week and make it a full position. XOM has the lowest yield relative to COP, CVX, and BP. 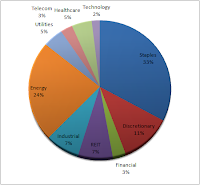 However, it provides the least volatility and has a decent share buyback program. I threw BP out the window as an option since they have messy oil spill issues (and its dividend history is screwed up). I ended up having to decide between COP and XOM. COP dropped significantly more than XOM recently (so it's a better value) but it is a more volatile stock. COP has the advantage of higher growth and a higher yield. Ultimately though, I prefer stability over gains and I value XOM's moat. There are certain dividend aristocrats you can't go wrong with and XOM is one of them (that is until oil runs out...). October has been a bad month for many stocks in the S&P500. This provides us with an opportunity to add positions to great companies at decent valuations. The energy sector in particular is incredibly hard hit the last couple of weeks due to falling crude oil prices. I think this provides us with a great opportunity for dividend champions such as Chevron, Exxon, and ConocoPhillips. In addition to falling oil prices, several industrial sector names have fallen to attractive price valuations in my eyes. These names include UTX and MMM. Below are several graphs showing stocks that are high in my watchlist for purchase this month. Currently CVX and COP look cheap on a PE basis and both have dividends higher than my 3.5% target. BP has a very high yield with good looking valuations. In terms of volatility I will still prefer XOM, COP, and CVX over BP. BP is a riskier play especially after the oil spill. The PEG is attractive in CVX, COP and BP. BP has cut its dividend in the past which makes me hesitant to buy it. CVX and XOM are dividend aristocrats so it's business as usual. It is quite impressive that they have maintained around 10% of annual dividend growth continuously. COP offers the highest dividend growth which makes it attractive. COP also has the highest yield out of the three dividend payers. COP has been paying dividends continuously for 14 years. I am not impressed by BP's dividend growth and history. That may be because BP already has a high yield. These are two very different stocks. I added ARCP in my Roth IRA since it is a REIT which pays large monthly dividends. I feel that this stock is undervalued at the moment. My two REIT players are now O and ARCP. I feel that ARCP is a riskier play so I do not plan on making this one a full position yet. V is a growth stock that I believe will have large dividend growth and capital gain potential. Its dividend yield is low but its growth prospects are extremely high. I believe the price after the recent correction makes it attractively valued. The reason I purchased a very high yield stock and a very low yield stock today is so that I can maintain an average yield of around 4%. I have additional capital coming in very soon and am holding them as cash until I feel that the time is right to purchase XOM/CVX/COP/BP. I feel that the oil sector is extremely undervalued at the moment; however, I do think that they can still fall further which is why I am waiting. I have purchased 13 additional shares of Verizon for 49.76$ a share.